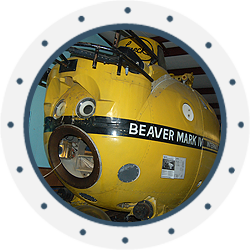 Owned by the Institute of Diving, the Man in the Sea Museum showcases the progress of underwater technology, from the earliest days of diving to the most modern underwater habitats. The Institute of Diving is a non-profit, educational organization formed in 1977. The initial idea for establishing the institute and its museum was conceived in 1976 by a group of divers from the U.S. Navy’s SEALAB Program and representatives from commercial, academic, scientific, medical, and sport diving fields. Man has been exploring the earth’s underwater environments for thousands of years, and yet it appears that the more we learn, the less we know. Early diving efforts involved numerous imaginative devices, including breathing tubes and leather sacks, inflated animal skins, and just breath-holding while carrying heavy rocks. Though primitive, such actions indicate man’s ancient desire to explore the ocean depths. This desire spawned generations of research and experimentation to find safe ways to work in and learn from the sea. Despite generations of exploration, the ocean is still a mystery. And yet, with its wealth of untapped resources, it has become increasingly clear that one key to man’s future lies beneath the sea. We are here to bring you the most recent news and updates on the progress of underwater scientific and technological endeavors, the discovery of artifacts, and man’s impact on the earth’s aquatic environments. The Man in the Sea Museum, founded in 1982, is visited by local residents, school children and thousands of tourists. Many good things have happened over the last thirty years, all of which created great benefits and corresponding requirements. The present 5,000 square foot museum with its comprehensive collections, sits on one acre of land on Panama City Beach Parkway (Highway 98). 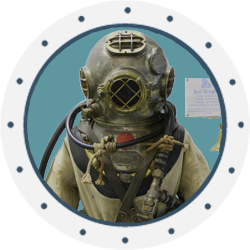 The Man in the Sea Museum brings you treasures recovered from sunken ships dating from 1500, along with more recent commercial and naval equipment, vehicles, and habitats. Both kids and adults can climb through SEALAB-I and other selected exhibits. 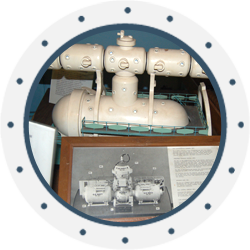 Come see displays of early diving equipment and watch videos of showing how it was used! Maintain a public museum to collect, preserve, educate, and display artifacts and documents of historical record and value. Develop and promote programs and projects for the improvement of scientific and technical knowledge of the membership and the general public. Provide a library from which the membership may draw information. Accommodate and support professional and scientific communication.